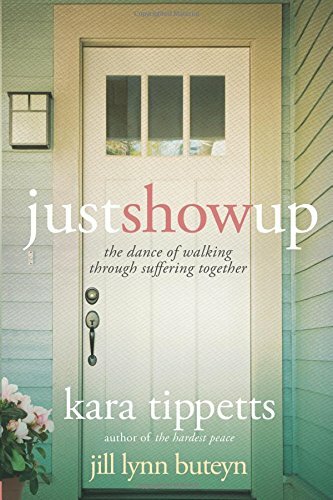 Just Show Up by Kara Tippetts and Jill Lynn Buteyn is a beautiful book of friendship and community, laughter and tears, life and death. The book is mainly written by Jill but Kara writes two pages at the end of each chapter. There are also two questions at the end of each chapter designed to make the reader think. It is a bitter sweet book but it is a work of great beauty. This is Kara’s second book. She is a young mum of four fighting cancer. She needs her friends around her to help with the mundane day to day things. Jill writes about how important it is, just to turn up and be there for your friend. Do not wait until you feel qualified to help or you will never do it. “God uses those of us who aren’t qualified so that He is glorified. And when we show up, we are blessed.” In our weakness we become strong by leaning on God. The focus of Just Show Up is God. Kara in spite of her suffering still believes in the goodness of God. Many times she says “suffering is not the absence of God’s goodness.” Too many people question the goodness of God in hard times but God is good. He walks alongside us in our hardships. Kara never loses sight of Jesus, saying “Jesus always shows up.” For her, it is all about Jesus. “She (Kara) might state things are not well, but she always, always comes back to Jesus.” Oh that we too would always live with our eyes fixed on Jesus. God never meant us to do life in isolation. Kara believes in community and doing life together. Jill shows the reader what this community looks like. It is important to live with an eye on others and not on self. When people live like this, everyone pulls together and it is beautiful. There is a chapter that discusses giving and receiving. It is so much easier to give than to receive but sometimes one just needs to admit that help is needed. It is humbling but in accepting help, the giver will be blessed. Due to the nature of Kara’s battle there is a chapter about heaven. One of her friends, Blythe “lives with an eternity mentality.” Jill discusses what heaven will look like – the Bible tells us it is a place of no more suffering and no more tears. Kara and her family and friends are holding on to this promise. I have read both of Kara’s books back to back. They are both full of sound advice and Godly wisdom. They are not books about cancer. They are books about doing life while battling cancer. They are about loving well and loving big. They are about family and friends. And most importantly they are about God. Download The Hardest Peace and Just Show Up today. Read about doing life and doing hard life in partnership with family, friends and God.